We've spent the last week recovering from an awful tummy bug which is not exactly how I thought I would be spending the first week of the summer break! We all seem to be Ok now (fingers crossed) but it's meant a last minute rush to do all the things I thought I was going to have a whole week to do! The Brambles Beret was featured in the Deep Fall 10 issue of knitty.com. I love the look of the petal like shaping on the crown and when my dear friend requested a beret for Christmas this was the one we chose together. It's a lovely pattern with not as much cables as you would think. There are options for slouchyness, and head sizes and the instructions were clear, including how to block it out without stretching the ribbed band. I forgot from past experience using this yarn that it was very short yardage and of course I soon realized I was going to run out of yarn. This resulted in some fairly radical modifications to the crown shaping (I estimate I probably decreased twice as fast as the pattern). My version doesn't have the dramatic petal shapes that the pattern has but, in the end I think it turned out OK. My friend has quite short hair (and luckily not a big head) and the size suits her fine. I love the colour of the yarn on her too so all in all I was pretty happy with how this little bit of Christmas knitting turned out. This year I've been trying to read more books. I used to be a voracious reader, but having children put a stop to spending all day (and night) reading and it's been a quite some time since I read more than one or two books a year. Now my children are older, and I'm not spending my evenings breastfeeding or falling asleep as I put the kids to bed, I've rediscovered the book love. And discovered audio books. My new love. I was skeptical at first but soon realized that audio books and knitting are a match made in heaven. This was such an interesting read (or listen...whatever). Set in the 1600's the story is based on actual events that happened in an English village during the year of the Great Plague of London. At times it was a sob inducing and harrowing read, but what I liked most was the unassuming strong female protagonist and the way she was able to find strength and courage in what must have been a devastating situation. The plague comes to their small village in a bolt of infected cloth, and the village decides to quarantine itself to stop the spread of the disease. With death and despair wrecking havoc on the community, we see the destruction of relationships, the spread of superstition, the loss of hope, but through it all there is also the exploration of love and learning. At the heart of this book is a gripping tale of survival in the face of disaster. I thoroughly enjoyed this. 5/5 stars from me. 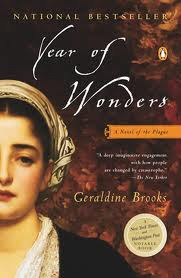 I have "People of the Book" another of Geraldine Brooks novels on my "to read next" list, and am looking forward to reading more from this author. DD (who is now 5 and off at school) came home the other day with a very special book in her reading folder. Her very own copy of "Quaky Cat". Scholastic, author Diana Noonan and illustrator Gavin Bishop have teamed up to publish this beautiful and touching book set in Christchurch. The story is set on the day of the 7.1 magnitude quake that rocked our city. Sept 4th will forever be a day that is etched into our collective memories - now 3 months on - we are still somewhat in shock that such an event happened here....to us. The book follows the story of Tiger, a beloved pet who runs away from home after the quake and then navigates across the broken city to reunite with his family. I have to admit to being just a little bit teary eyed when I got to the end of the book. It's a lovely story, beautifully illustrated and captures so well some of the emotions that all of us, humans and pets alike, felt during the quake. Scholastic donated a free copy of this book to all Year 1 & 2 students in Canterbury and it will always have a special place of pride on our bookshelf. Thank you to everyone involved in this project. Proceeds from the book are donated to local charities including the Women's Refuge. You can buy it here. Homemade hummus for afternoon tea. I was without food processor for so long, I often still "mentally skip" the recipes that require one. Recently Mum gave me her old one and I've been having fun trying out some new (to me) recipes - like hummus. I overdid the garlic...mmmm garlic breath....so know for next time that more is not always better in that department. Next time I might try adding some sundried tomatoes. It's that time of year - the Christmas crafting rush. It seems many in blogland are last-minute knitting/sewing/making as the big day looms just a few weeks away. In the weekend the kids and I had some fun with my collection of beads to whip up some little gifts. I'd like the girls to grow up thinking of the season as one of giving - sometimes hard to remember in this world where advertising (and the accompanying ridiculous expectations) seem to infiltrate our lives. Luckily, they're always super keen to be making things for loved ones. A friend destashed her collection of bits and pieces to us the other day and included was this glass pendant which we added beads to, to make a hanging in the window sun catcher thing. It's the first time I've made something like this and it turned out pretty well. The little ones and I used their own plastic beads to string onto elastic for colourful bracelets. Practicing their threading skills, hand-eye co-ordination and for Miss 5 a talk about patterns. And Miss 8 had a turn with my beading tools to make a pair of earrings. Miss Smith has some other excellent handcrafted gift ideas for adding some handmade-with-love to your Christmas this year. I have another request for handmade bath salts again so will be getting supplies for those this week too. My first FO for my new blog is the Multnomah Shawl I made for my great-aunt for Christmas. She has been unwell and is currently undergoing chemo treatment so I wanted to make her something special this Christmas. The pattern is from HelloKnitty and was a joy to knit. Lots of mindless garter stitch to begin with which was perfect for knitting while listening to my audiobook, then some easy feather and fan lace. Both elements are fairly simple to knit and to look at, but I think combining the two has made an impressively pretty result. The yarn I used was from JOY which is a specialist sock yarn store based in New Zealand. The colourway is "Blue Lagoon" and is their own merino 4ply sock yarn and I used one skein. The dye job was beautiful. The pictures don't really pick up all the subtle colours but it really is a pretty mix of blues, from lightest through to small patches of almost navy. It knit like a dream, despite the hard twist, and I am quietly glad I bought a second skein (just in case) which I hope to eventually turn into a pair of socks for myself. Maybe I'll use the extra skein to make one of these for myself instead ;) I'm quite drawn to how this looks as a kerchief style scarf. There are more notes on my Ravelry page where you can find me as sweetp. Knit with love in every stitch.